Details: An abstract interaction of strong visual, corporal and sonic gestures, conducted by the rhythm of breathing. Based on the series of “Breathing Drawings” and the artist book “flock” by Alejandro Casazi. 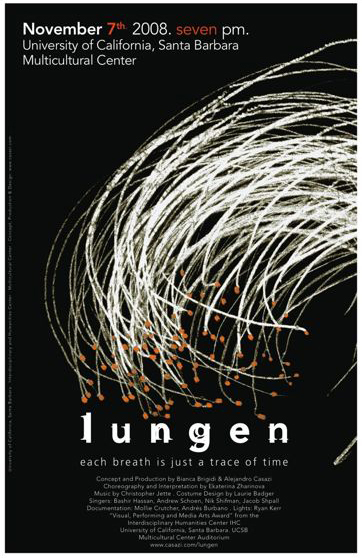 Lungen is a multilayered performance piece, created by Bianca Brigidi Alejandro Casazi, Christopher Jette and Ekaterina Zharinova, awarded the “Visual, Performing and Media Arts Award” by The Interdisciplinary Humanities Center (IHC), University of California, Santa Barbara (UCSB). The interconnection of dance (performed by Ekaterina Zharinova), sound (Christopher Jette, and singers) and drawing (Casazi) is based on empathic repetitive movement, sound and time: the breathing. Serving as a prelude to the performance and as a testing ground for ideas, the prelude video introduces the sonic and visual aesthetic.